Adrenal insufficiency (AI) remains a significant cause of morbidity and mortality in children with 1 in 200 episodes of adrenal crisis resulting in death. The goal of this working group of the Pediatric Endocrine Society Drug and Therapeutics Committee was to raise awareness on the importance of early recognition of AI, to advocate for the availability of hydrocortisone sodium succinate (HSS) on emergency medical service (EMS) ambulances or allow EMS personnel to administer patient’s HSS home supply to avoid delay in administration of life-saving stress dosing, and to provide guidance on the emergency management of children in adrenal crisis. 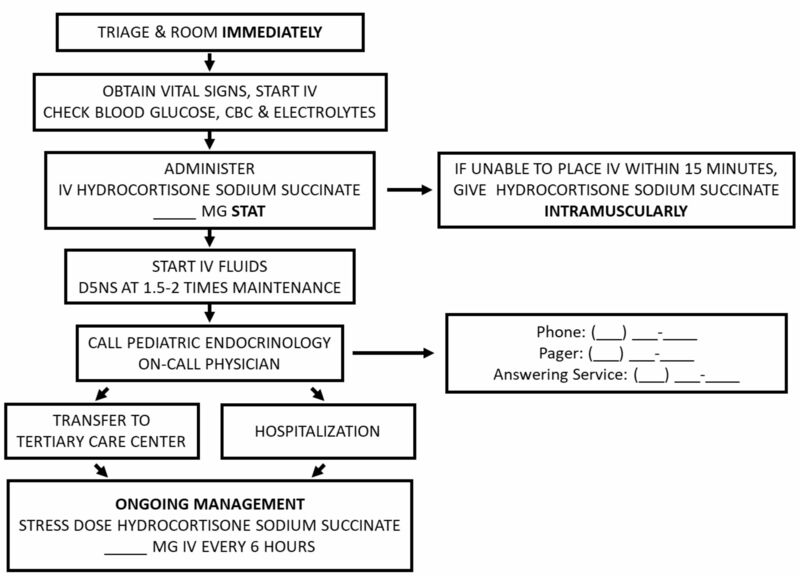 Currently, hydrocortisone, or an equivalent synthetic glucocorticoid, is not available on most ambulances for emergency stress dose administration by EMS personnel to a child in adrenal crisis. At the same time, many States have regulations preventing the use of patient’s home HSS supply to be used to treat acute adrenal crisis. In children with known AI, parents and care providers must be made familiar with the administration of maintenance and stress dose glucocorticoid therapy to prevent adrenal crises. Patients with known AI and their families should be provided an Adrenal Insufficiency Action Plan, including stress hydrocortisone dose (both oral and intramuscular/intravenous) to be provided immediately to EMS providers and triage personnel in urgent care and emergency departments. Advocacy efforts to increase the availability of stress dose HSS during EMS transport care and add HSS to weight-based dosing tapes are highly encouraged. A 9-year-old boy presented to a local emergency department (ED) with chronic abdominal pain, acute onset of nausea and vomiting for the previous 24 hours. Physical examination revealed an ill-appearing, thin male with tachycardia (pulse 110 bpm), mild hypotension (85/60 mm Hg), signs of dehydration, and hyperpigmentation. Laboratory testing showed hyponatremia (sodium 129 mEq/L), hyperkalemia (potassium 5.8 mEq/L) and hypoglycemia (glucose 55 mg/dL). Despite urgent fluid resuscitation with 2 intravenous boluses of normal saline and a bolus of 10% dextrose, hypotension persisted. Due to clinical and biochemical features suggestive of primary adrenal insufficiency (AI), blood was drawn for measurement of adrenocorticotropic hormone (ACTH) and cortisol levels prior to administering 75 mg of intravenous hydrocortisone sodium succinate (Solu-Cortef). He was admitted and diagnosis confirmed. Treatment was initiated with hydrocortisone and fludrocortisone. The patient and family received education for the management of primary AI and prevention of adrenal crises. Two years later he developed acute gastroenteritis with fever, vomiting and diarrhea while visiting his grandparents in a rural area. He received triple his usual dose of oral hydrocortisone, but vomited within 10 minutes. Grandparents had hydrocortisone sodium succinate available for intramuscular injection, but did not know how to administer it and called 911. The patient was unresponsive on arrival of the ambulance 20 minutes later. Grandparents informed the emergency medical technicians (EMT) that he needs to receive hydrocortisone sodium succinate intramuscularly for AI. Due to emergency medical services (EMS) policy, the EMTs were not allowed to administer the child’s personal supply of hydrocortisone sodium succinate and did not have an alternative medication on the ambulance. Glucometer revealed a blood glucose of 30 mg/dL. While EMTs attempted to place an intravenous catheter, he experienced a seizure. He was intubated and received intravenous dextrose with cessation of the seizure. He was transported to a local ED that was 30 minutes away. In the ED, he was given 75 mg intravenous hydrocortisone sodium succinate and was admitted to the intensive care unit where he later died of complications related to prolonged hypoglycemia and aspiration pneumonitis. Adrenal crisis is a life-threatening condition that can be prevented by recognition in which patients with AI must receive additional glucocorticoids when under physiological stress. Adrenal crisis can also occur as the initial clinical presentation of AI. Appropriate management requires immediate recognition of the clinical signs, symptoms and biochemical profile of AI and the triggers for adrenal crisis. Therefore, primary care, urgent care and ED providers must be trained to recognize the diverse clinical circumstances in which AI can occur. In children with known AI, parents and care providers must be familiar with the administration of maintenance and stress dose glucocorticoid therapy to prevent adrenal crises. This can be facilitated by providing the family with a written Adrenal Insufficiency Action Plan and Emergency Care Letter. Currently, hydrocortisone, or an equivalent synthetic glucocorticoid, is not available on most ambulances for emergency administration by EMS personnel. In addition, EMT training on the use of patient’s home medication is not widely employed. Both of these situations can lead to life-threatening delays in providing appropriate therapy to prevent or treat adrenal crises. AI is a significant cause of morbidity and mortality in children1–3 with an annual estimated incidence of adrenal crisis of 5–10 episodes per 100 patient-years, with increasing rates in some countries.4 One in every 200 episodes of adrenal crisis results in death.5 Therefore, the goal of this working group was to raise awareness on the importance of early recognition and provide guidance on the emergency management of AI in children during illnesses, particularly in the outpatient, EMS and ED settings. AI is characterized by impaired adrenal synthesis of glucocorticoids. When reduced production of mineralocorticoid (aldosterone) is present it is associated with hyponatremia due to salt-wasting and reciprocal hyperkalemia. AI can be categorized as primary, where the defect is in the adrenal gland, or secondary (central), where the defect is due to hypothalamic and/or pituitary dysfunction. In the central forms deficient secretion of ACTH leads to atrophy of the zona fasciculata in the adrenal cortex (the source of glucocorticoids); mineralocorticoid production by the zona glomerulosa is preserved because the renin-angiotensin system is intact. The most common cause of primary AI in children is congenital adrenal hyperplasia (CAH), the leading cause of atypical genitalia in female newborns. Less common causes of primary AI include autoimmune adrenalitis (isolated or part of autoimmune polyglandular syndromes), infections, bilateral adrenal hemorrhage, and various genetic syndromes including X linked adrenoleukodystrophy6–8 (see table 1 and box 1). Fungal: coccidioidomycosis, histoplasmosis, blastomycosis, cryptococcosis. Hemochromatosis, histiocytosis, sarcoidosis, amyloidosis, neoplasm. Corticosteroid withdrawal after prolonged administration (inhaled, intranasal, oral, rectal, intravenous and topical). Corticosteroid withdrawal after parenteral administration of high doses of potent and longer acting preparations (intramuscular, intradermal and intra-articular routes). Drug effect: megestrol, mitotane, medroxyprogesterone, rifampin, phenytoin, barbiturates, tyrosine kinase inhibitors (eg, sunitinib). Corticosteroid withdrawal after prolonged administration. The most common cause of secondary (central) AI is low ACTH due to iatrogenic suppression of the pituitary corticotrophs by prolonged use of supraphysiological doses of oral glucocorticoids typically prescribed for the treatment of medical conditions including but not limited to asthma, hematologic/oncologic conditions, inflammatory bowel disorders, rheumatologic conditions, nephrotic syndrome, neurologic disorders, postneurosurgical procedures, and hematopoietic and solid organ transplants. Glucocorticoids administered by intra-articular, topical, intradermal, and inhaled routes may also suppress the hypothalamic-pituitary-adrenal (HPA) axis.9 10 Other medications, such as megestrol acetate, ketoconazole, and mifepristone, also impair adrenal function via direct and indirect mechanisms. Less common secondary causes of ACTH deficiency involving the pituitary and hypothalamus include tumors, radiation exposure, congenital anomalies, and specific gene defects (table 1 and box 1). Inherited forms of ACTH deficiency are usually associated with additional pituitary hormone deficiencies. During the process of recovery from HPA suppression, physiological circadian secretion of cortisol may recover before return of the ability of the hypothalamus to respond to stress.19 Therefore, a patient may have a normal 8:00 AM cortisol, but still be unable to show an appropriate serum cortisol response to stress.20 21 The wide variability in timing of recovery of the HPA axis after discontinuation of glucocorticoid exposure emphasizes the need for clinicians to be aware of clinical scenarios with an increased risk of AI. Diagnosis of AI can be challenging as the clinical signs are not specific and may progress insidiously over time. Adrenal crisis can be precipitated by acute illness, physical stress or injury requiring increased cortisol production above basal needs in the setting of normal adrenal function. In addition, induction of anesthesia and surgery can precipitate acute AI. Acute AI can present with fatigue, weakness, tachycardia, hypotension, dizziness, nausea, vomiting, abdominal pain, diaphoresis and seizures. If unrecognized and not treated quickly, AI can progress to coma and death.3 6 9 22–25 Prolonged cholestatic jaundice, failure to gain weight and hypoglycemia may be the presenting clinical features in neonates and infants. Micropenis, bilateral cryptorchidism and, rarely, central diabetes insipidus may also be present in neonates who have AI due to panhypopituitarism. Individuals with primary AI may have hyperpigmentation of the skin (particularly creases, folds and scars), gums and buccal mucosa. In acute AI, hyponatremia is the most consistent biochemical finding.12 Hyperkalemia is present in primary, but not secondary AI, and can be associated with hypercalcemia and metabolic acidosis. Hypoglycemia is more frequent in neonates and infants regardless of the type of AI. Other findings include normocytic anemia, lymphocytosis and eosinophilia. The diagnosis of primary AI is suggested by blood tests preferably performed at 8:00 AM that show an ACTH level greater than 100 pg/mL and a cortisol level less than 10 mcg/dL1 or by an ACTH level that is twofold greater than the upper limit of the normal range and a cortisol level less than 5 mcg/dL.8 26 Low serum aldosterone with elevated plasma renin activity is the hallmark of mineralocorticoid deficiency. Secondary AI is associated with low levels of both cortisol and ACTH. An 8:00 AM serum cortisol level of ≤3 mcg/dL is highly suggestive of the diagnosis whereas a cortisol value of ≥18 mcg/dL essentially excludes AI.1 If AI is suspected during an acute illness, a random cortisol and ACTH should be obtained prior to initiating glucocorticoid therapy. A serum cortisol concentration less than 18 mcg/dL during acute illness can be indicative of AI.12 Cortisol and ACTH levels may be difficult to interpret in neonates and infants as circadian pattern of secretion does not appear until 4 months27 and cortisol-binding globulin is low causing low total, but not free, serum cortisol. There is limited empirical evidence to guide the optimal glucocorticoid stress-dosing of children and adolescents who have AI. While the debate about what constitutes physiological stress is unresolved, several situations are generally accepted as significant stress including: fever >38°C (100.4°F), intercurrent illness with emesis, prolonged or voluminous diarrhea, infectious disease requiring antibiotics, acute trauma requiring medical intervention (eg, fracture) and anesthesia and associated surgical procedures. Guidelines on cortisol requirement in times of physiological stress have been based on the general acceptance that conditions of maximal stress increase the serum cortisol levels by 2–3 times.1 5 26 31 Treatment recommendations below are based on recent literature on glucocorticoid replacement therapy. 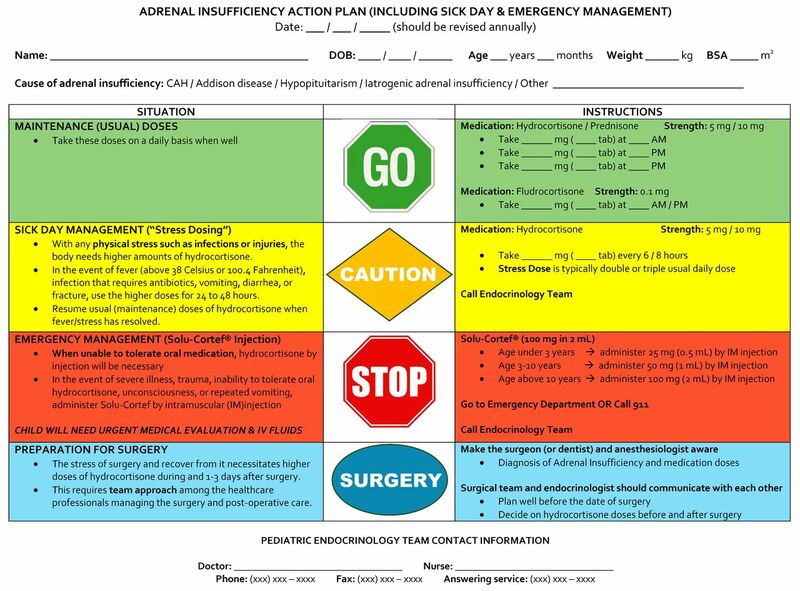 In this guideline, we outline an Adrenal Insufficiency Action Plan (figure 2) and an Adrenal Insufficiency Instructions for Emergency Room Staff (figure 3), a stepwise approach to hydrocortisone dosing during illness similar to the extremely successful Asthma Action Plan.56 Our goal is to provide clear guidance for caregivers, primary care physicians, urgent care and emergency providers for appropriate stress dosing of hydrocortisone or its equivalent in children with known AI during illness and surgical procedures to prevent and treat adrenal crisis. The Adrenal Insufficiency Action Plan provides instructions for oral stress dosing with hydrocortisone (double or triple the daily dose given every 6–8 hours) and injectable hydrocortisone dosing when unable to take oral stress dose. All children with AI should be provided with an individualized care plan (Adrenal Insufficiency Action Plan and/or medical letter, see figures 1, 2 and 3), which could be made available in EMRs. The use of such tools has been shown to improve patient education regarding management of physiological stress in outpatient settings.32 33 In addition, children with AI need a medical alert identification for EMS personnel. Adrenal Insufficiency Emergency Care Letter. 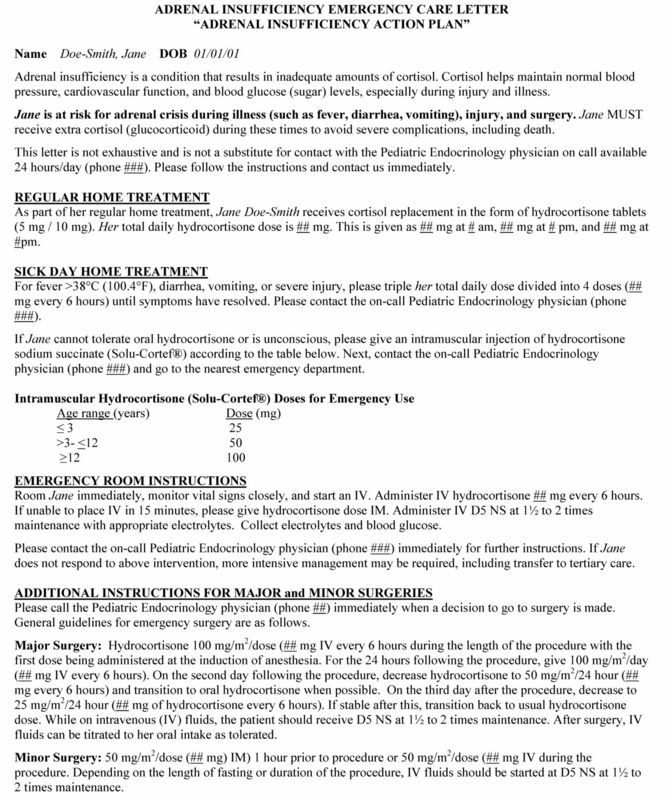 Adrenal Insufficiency Instructions for Emergency Room Staff. CBC, complete blood count; IV, intravenous. Vague and non-specific symptoms of AI make the diagnosis of adrenal crisis easily overlooked in the ED triage process. Hypotension and hypoglycemia can develop suddenly in the ED,65 even after normal triage assessments. Providers must exercise a high index of suspicion for adrenal crisis in any child who is at risk of AI (table 1 and box 1). In cases of known AI the ED letter (figure 1, modified from ref 66) or Adrenal Insufficiency Action Plan should be given to triage personnel on arrival to the ED to speed the process. The initial stress dose of hydrocortisone sodium succinate given by family, EMS, or in ED should be followed by 50–100 mg/m2/d divided into 4 doses given every 6 hours or given by continuous infusion.1 5 26 60 In the ED, intravenous dosing is preferred for the initial stress dose, however, if an intravenous catheter cannot be placed quickly, the initial dose should be given intramuscularly. Ongoing stress doses are typically given parenterally for the first 24–48 hours and then transitioned to oral dosing if feasible. Because hydrocortisone sodium succinate in high doses has mineralocorticoid effect, no fludrocortisone is needed while the patient receives intravenous fluids and stress doses of hydrocortisone. Appropriate evaluation (as described above) should include biochemical documentation of the AI (serum cortisol and plasma ACTH levels), assessment of hydration and acid-base status, and investigation of an underlying precipitant. Ideally, a blood sample should be collected prior to administration of hydrocortisone sodium succinate, especially for patients with a suspected new diagnosis of AI; however, treatment should NOT be delayed if obtaining a blood sample proves difficult. In an acute adrenal crisis, hypovolemia should be rapidly reversed with a 20 mL/kg bolus of isotonic solution, preferably normal saline. Hypoglycemia should be treated with a 2.5 mL/kg bolus of 10% dextrose solution and repeated if the response is not adequate. Patients with known AI and their families should be provided an Adrenal Insufficiency Action Plan, including maintenance hydrocortisone dose, stress dose for hydrocortisone (both oral and intramuscular/intravenous) and contact information for their endocrinologist. They should be instructed to keep this with them at all times and to provide it immediately to EMS providers and triage personnel in urgent care and emergency departments. All patients with known AI should carry medical alert identification indicating the diagnosis and glucocorticoid dependency. Families should be educated to use intramuscular hydrocortisone sodium succinate for emergency situations. Development of FDA-approved hydrocortisone formulations that allow for smaller, more precise dosing in infants and young children with AI. Awareness of the multiple potential causes of AI, including glucocorticoid therapy for other conditions, and a high index of suspicion for AI in children presenting with hypoglycemia, hyponatremia and hypotension is necessary to identify new cases of AI and urgently treat adrenal crises. Acute adrenal crisis requires rapid treatment of hypovolemia, hyponatremia, and hypoglycemia with normal saline and 10% dextrose intravenously in addition to stress dose hydrocortisone administration. Hydrocortisone should be added to weight-based dosing tapes. Emergency medical transport services should be aware of and emphasize emergency administration of stress dose hydrocortisone sodium succinate within constraints of their systems. Advocacy efforts to increase the availability of stress dose hydrocortisone sodium succinate (Solu-Cortef Act-o-Vial, preferably 100mg/2mL) during emergency medical transport care, including mobile care units, are highly encouraged. Patients with AI (primary or secondary) may present to EMS personnel or the ED in an acute life-threatening crisis needing prompt and effective management to avoid severe consequences. This document offers evidence and consensus-based expert guidelines for most effective management of AI in the emergent scenario. A high index of suspicion needs to be maintained in all patients at risk for acute adrenal crisis.
. Systemic adverse effects of inhaled corticosteroid therapy: A systematic review and meta-analysis. Arch Intern Med 1999;159:941–55.
. The low dose ACTH test-a further word of caution. J Clin Endocrinol Metab 1998;83:712–3. Diurnal’s Chronocort fails in phase 3 congenital adrenal hyperplasia trial. 2018 https://www.pharmaceutical-business-review.com/news/diurnals-chronocort-phase-3-trial/ (updated 30 Oct 2018).
. Stability of an alcohol-free, dye-free hydrocortisone (2 mg/ml) compounded oral suspension. Int J Pharm Compd 2018;22:66–75. Be Prepared for An Emergency!. 2018 https://www.caresfoundation.org/emergency-medical-care/. Newfoundland and Labrador paramedics can now administer hydrocortisone. 2018 http://www.thelabradorian.ca/news/newfoundland-and-labrador-paramedics-can-now-administer-hydrocortisone-242235/. Adrenal insufficiency: Emergency instructions. 2018 http://pedsendo.org/patients_families/pdf/AITemplateLetter.pdf. Contributors All the authors have participated in the concept and design, analysis and interpretation of data, drafting or revising of the manuscript, have approved the manuscript as submitted, and have agreed to be accountable for all aspects of the work. Competing interests BSM is a consultant for AbbVie, Ascendis, Ferring, Novo Nordisk, Pfizer, Sandoz, Soleno and Tolmar and has received research support from Alexion, Ascendis, BioMarin, Endo Pharmaceuticals, Genentech, Genzyme, Novo Nordisk, Opko, Sandoz, Sangamo, Shire, Tolmar and Versartis. MK received grant support from T1D Exchange Quality Improvement Collaborative. MG is a consultant for Spruce Biosciences, Millendo, Pfizer, and BridgeBio. KS receives research support from the DHHS Federal Food and Drug Administration, NIH National Cancer Institute, March of Dimes, National Science Foundation, Spruce Biosciences, Alexion and Neurocrine. Presented at The work has been presented at Pediatric Academic Society Meeting 2018, ’Year In Review: Emergency Management of Adrenal Insufficiency in Children: A Clinical Practice Guideline', Toronto, Ontario, Canada, May 2018.